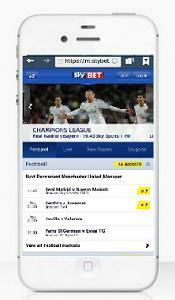 If you’re looking for an advanced mobile app that meets all of your betting needs, look no further than the App Store where you can download the latest Sky Bet Mobile App for iOS devices, or simply visit the Sky Bet mobile site to place bets on your Android device. Whether you’re a fan of sports, bingo, Vegas or casino games, Sky Bet has a mobile specifically tailored to meet all of your betting needs, like Sky Vegas Mobile and Sky Bingo Mobile. There is also a dedicated sky bet mobile site for Sky Sports News, Sky Bet’s Football Score Centre, Sky Bet’s Cricket Score Centre and a mobile sky bet site for live sporting action streamed directly to your iPhone, iPad or Android device. Sky Bet recently unveiled a slick new design for their mobile betting application and mobile sites, but if you’re an iPhone or iPad user, you’ll have to make sure you’re running iOS 6 or later in order to take advantage of the latest Sky Bet mobile features. Like the online site, Sky Bet mobile has a familiar feeling that incorporates an easy to use navigation menu, and simply laid out betting features. Prominently displayed from the home screen are football and horse racing markets (the staples of Sky Bet). It’s also simple for punters to access specific sporting events, thanks to an intuitive layout that is organized logically by date, time and more. When it comes time to place a bet, you can easily access and submit betting slips with the push of a button.